The sun is setting on the MobileMe era. By the time Sunday rolls around—on June 30 at 11:59 p.m. Pacific Time to be precise—the cloud storage and syncing service that Apple debuted in 2008 will fade away. You've been warned—and if you're a MobileMe subscriber, you've been warned repeatedly over the past month— that whatever preparations you need to make for this event have now come due. Procrastinators must face the reality that like it or not—and many people had mixed feelings about MobileMe from the start—it’s over and the new era of iCloud is beginning. Apple's iCloud service, introduced by Steve Jobs at the 2011 Worldwide Developers Conference, boasts a number of advantages over its predecessor. Unlike MobileMe, it’s free—at least for the first 5GB of stored data—and it replaces a vast part, though not all, of the service's marquee features. There's no way to forget that MobileMe is on its way out. The new iCloud, much like the old MobileMe, aims to sync all of your devices, from your desktop Mac (running Lion) to your iPhone and iPad, and even some Windows computers. Specifically, iCloud offers document and data sync, mobile backup, location awareness, and purchase management. You can sync reminders from iOS 5’s Reminders app, Safari and iBooks bookmarks, and notes from the Notes app. Moreover, iOS devices can sync app data and documents and back up information online. While purchased content, such as apps, music, books, and videos—as well as Photo Stream—are included in iCloud, these don't count against the 5GB storage limit. With MobileMe will exit some high-profile defining elements: iDisk, iWeb site hosting, and Gallery. The services iCloud will not replace are available from a variety of other sources and Apple has helped users over time by loosening some deadline restrictions and throwing in some incentives. Below is a summary of the major functions that will not be making the trip to iCloud, some alternatives Macworld has considered over the past year, and some of the newer Apple initiatives designed to make it easier for MobileMe holdouts to take the iCloud plunge. MobileMe’s iDisk provides a 20GB online file storage for e-mail and files that you can access from the Finder or via the Web. If you enable iDisk Sync, you get automatically synchronized local copies of all your iDisk files, too. But with the demise of MobileMe, iDisk will bite the dust. That means you won't be able to sync Mac Dashboard widgets, keychains, Dock items, System Preferences, and data from third-party Mac apps integrating with MobileMe. While no universal substitute exists for MobileMe in its entirety, certain parts can be replaced piece-by- piece, as needed. For example, the Keychain sync could be handled by 1Password or other keychain utilities. And there are numerous alternatives to iDisk for storage, backup, and syncing. Macworld has detailed one method of replacing iDisk by creating your own online backup via a combination of file sharing, online storage, and FTP. There are also assorted utilities, such as Dropbox, Google Drive, SkyDrive, Box.net, Amazon Cloud Drive, SugarSync, iDrive, and others that can also serve as replacements for iDisk. Some of those are free of charge. 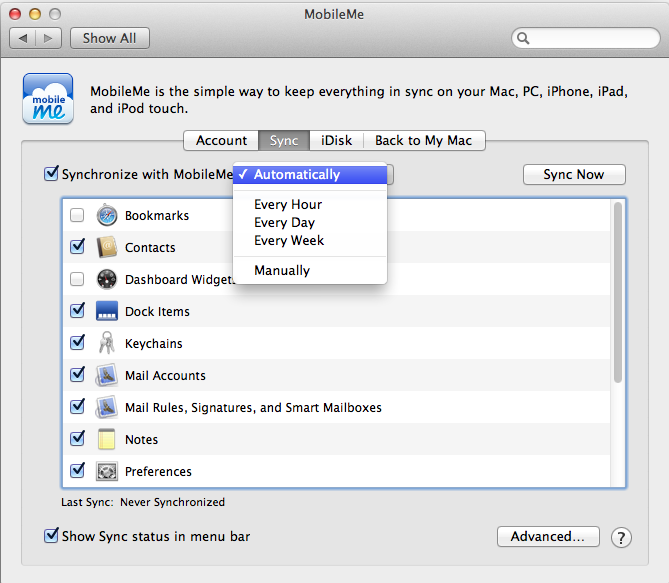 MobileMe had you covered in the sync department. Some of those choices will remain, but others will be eliminated. Cirrus Thinking's Dolly Drive, for example, is software that uses Time Machine as a mechanism for creating a desktop networked volume. This software, which comes with various plans and functions, can mostly replace iDisk functionality. A Dolly Drive competitor is Codefortytwo Software’s CrashPlan+, an online program that backs up your files in the cloud. No discussion of iDisk alternatives would be complete with Dropbox. It syncs across computers creating backup copies of your files, and facilitates collaborative and read-only sharing, access to older file versions, restoration of deleted files, and uploading images from attached cameras and phones. There's also a mobile app to go with it. SpiderOak and Sharpcast’s SugarSync are similar in concept. All three services include software that you can install on your Mac or on a Windows PC (SugarSync is also available for the iPhone and iPod touch). Once installed, you can easily sync files between your computers and an online storage area. Amazon Cloud Drive, which launched more than a year ago, now offers an Amazon Cloud Drive desktop app for Macs running Snow Leopard or Lion. You get the first 5GB of storage free. As part of the Cloud Drive service, users can also store digital music—from Amazon’s MP3 store or elsewhere—and play that music back on their computers. It also has a free mobile app. If you have a Hotmail account and are running Lion, you can get SkyDrive, a Microsoft product that lets you store files in the cloud via a special folder, similar to Dropbox. Like Dropbox, you can drag files to it to upload them to the SkyDrive server for online access anywhere. You get 7GB of free storage with SkyDrive, but there are a few premium options available, too. Perhaps nowhere has anxiety been higher than the prospect of losing MobileMe as a iWeb site host. That's because there are two distinct issues: one immediate and the other within line of sight. By Sunday morning, MobileMe will no longer act as a Web-hosting platform for iWeb, but sometime in the future, iWeb too, will no longer be usable. With MobileMe (and before it, .Mac), iWeb was an easy and seamless way to get websites online without the hassle of dealing with a third-party Web host or FTP clients. For iWeb, MobileMe was the one-click publishing solution people really got behind. If you currently publish an iWeb site hosted by MobileMe, and you have not transferred your site to a new Web host yet, you are almost out of time. 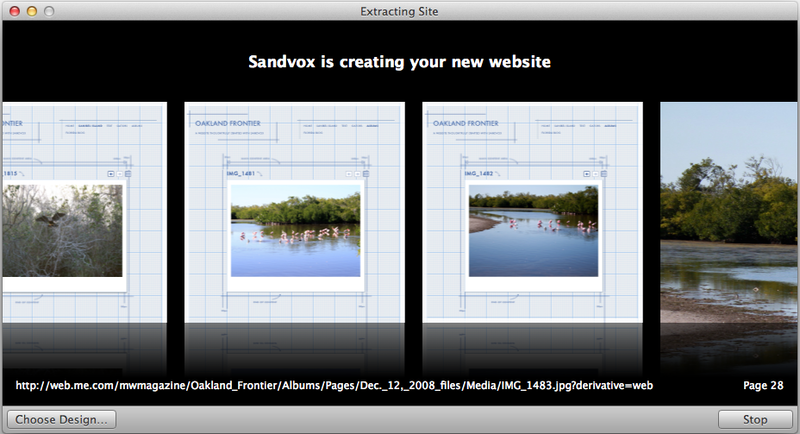 Sandvox has introduced a feature that extracts the content of your iWeb site pages and offers an approximation of the layout. It cannot reproduce your iWeb site to look the same as it did in Apple's program. Macworld examined some Mac-friendly Web hosts such as Digital Forest, Dreamhost, MacHighway, Fat Cow, MacMate, and others. Karelia Software, for example, recommends A2 Hosting for Sandvox sites and Realmac Software recommends Little Oak for hosting RapidWeaver sites. It's very easy to salvage your iWeb site for publication on a different host. In iWeb, after creating or modifying a site, choose File->Publish to a Folder. Enter your site’s URL and select or create a folder to hold the files. Then upload the files with an FTP program such as Panic’s Transmit or Nolobe’s Interarchy. There are a number of free FTP clients too, such as Cyberduck. Macworld has published several in-depth stories about how to transition from iWeb, too. While iWeb is still among us, and is still in good working order, it's widely anticipated that future generations of the Mac OS will eventually break the program, which is no longer being updated, and which is no longer for sale by Apple. 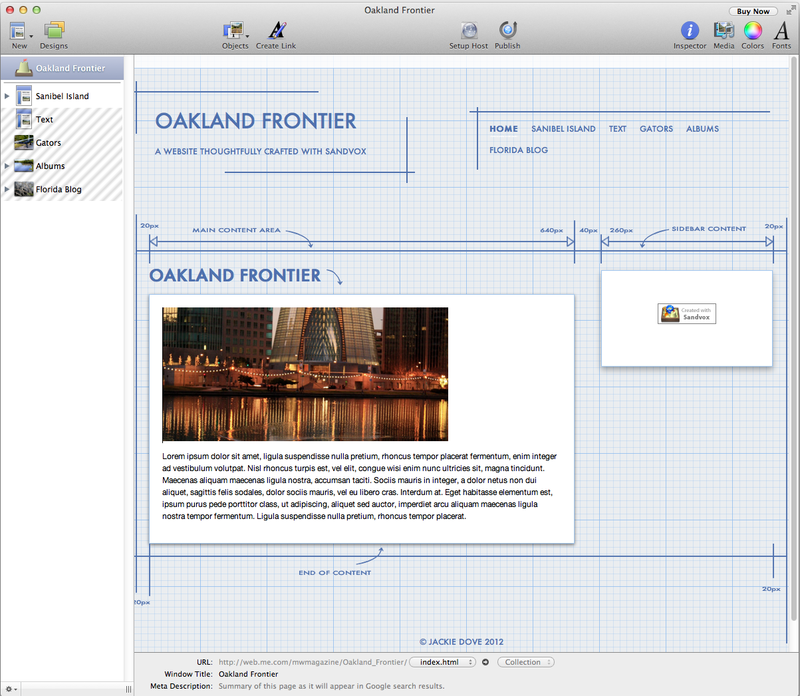 Both RapidWeaver and Sandvox are often considered the most Mac-like alternatives to iWeb. The recently released Sandvox 2.6 introduced an Extract feature that brings text and graphics from previously published websites—such as iWeb—into a new Sandvox document. 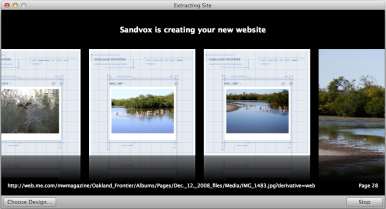 The extract feature lets you enter that website's URL and Sandvox automatically examines it, analyzes its main content, and creates corresponding pages in a new Sandvox document suitable for continued development and publishing to a different Web host. An extracted iWeb page in Sandvox. If you can't decide on a new Web host just yet, you can always publish your iWeb site via Dropbox. While not designed as a long-term solution, it's easy to do and very effective in keeping your website online for the time being. When it comes down to the wire, most ISPs offer limited free web hosting, and there are a number of other options like Google Sites and free blog-specific hosts like Blogger, Wordpress, and Tumblr. Free Web-based designers like Jimdo and Weebly also offer robust blogging tools. Although recently acquired by Twitter, Posterous is still available. Depending on the purpose of your site, it may be possible to simply use social networking sites to share content and information. As with iDisk, Apple is not offering a direct substitute for its MobileMe Gallery. This part of MobileMe lets you create gorgeous online albums of photos and movies—either by publishing your media from iPhoto or iMovie, or by uploading files via the Web. Many users loved the Web Gallery because it provided a private, ad-free, stylish interface with which to view vidual content via computer, iOS device, and Apple TV. Apple does provide a new feature called Journals in iPhoto for iOS that lets you create albums on the go. Journals differ from the elegant Gallery feature, but can serve the function of grouping images together in a pleasing way. However, at this point there are numerous other ways to share photos online, and in leaving users to fend for themselves, Apple acknowledges that MobileMe's single photo sharing method can be replaced by free, third-party apps and websites, though perhaps without the same flair. Many people loved the elegance of MobileMe's Gallery. By Sunday, it will be no more. For example, a free Flickr account lets you upload 100MB of media per month with unlimited total storage while a $25-per-year Pro account gives you unlimited photo and video uploads and other features. Smugmug presents your photos more stylishly than Flickr, but accounts with unlimited storage start at $40 per year. 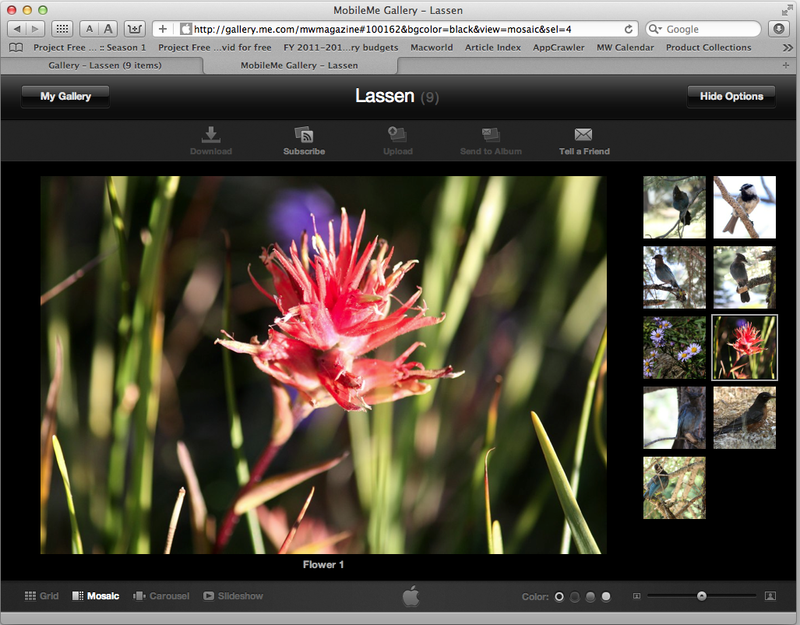 Both Flickr and Smugmug have Web interfaces for uploading photos, and optional Mac software to make the job easier. Dedicated photo sites like Picasa Web Albums, Photobucket, Shutterfly, and Adobe Photoshop Express let you organize and edit photos and order prints or photo-based merchandise, such as cards or books. Some of these features are also available in iPhoto, iPhoto for iOS, and in the iOS app Cards. Also consider that you might want to switch to social networks for sharing photos and creating galleries. For that you have Facebook, Twitter utiltities, and many iPhone and iPad sharing apps. 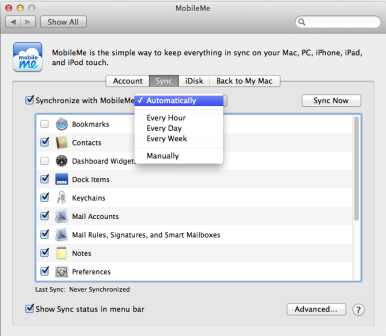 With iCloud, MobileMe refugees can still maintain access to Mail, Contacts, Calendar, Bookmarks, Find my Phone, and Back to My Mac features. For iDisk-style online storage, Apple hopes that you'll stick with iCloud, and if 5GB isn't enough that you'll purchase more. For folks who do not have a high volume, 5GB may be all you need to get iCloud's benefits—though different from MobileMe's—completely free of charge. While many people don’t have a philosophical problem about migrating from MobileMe to iCloud, they may have a software or hardware problem that prevents them from doing so. For users with older Macs that cannot run Lion, or who for other reasons do not want to upgrade to Lion, switching to iCloud is a problem. For them, Apple has solved the problem. On May 1, the company announced that it was giving Mail users a way to get ready for iCloud, advising that anyone wishing to retain their me.com or mac.com email address need only sign up for the service at me.com/move by June 30. Apple sweetened the deal further: MobileMe customers who had 20GB of storage will receive 25GB of iCloud storage for free until September 30; that much iCloud storage would normally cost $40 a year. MobileMe users who had purchased 40 to 60GB of storage will receive 55GB of free iCloud service, a $100-a-year value, until the new deadline. After that, users can choose to pay for the expanded storage space, or revert to iCloud's free 5GB of storage. Apple is also trying to ease the burden on some customers still running Leopard. Because you need at least Snow Leopard to install Lion, and Lion is the only desktop OS compatible with iCloud, Apple has offered Leopard users of MobileMe free upgrades to Snow Leopard. That paves the way for them to purchase Lion without the extra cost of two upgrades. The end of MobileMe and the beginning of iCloud give Mac users, PC users, and those with iOS mobile devices a lot to think about. While no one likes to change by force, MobileMe users have had a long time to mull alternatives to the service and decide how to proceed. Now's the time to take the plunge. You might find that the water feels just fine. 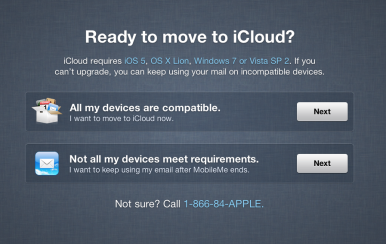 This story was updated on 6/28 at 2:30 PST to clarify Apple's solution for MobileMe email users who want to switch to iCloud without running Lion. Multiple ways to restore your data. Desktop and iOS app work seamlessly together. Size limit when restoring files from Web Restore. Initial backup can be slow.